Kazan’s pedestrianized Ulitsa Baumana is your best bet if you want to go on a pub crawl. It starts at the entrance to the city’s historic Kremlin, then runs all the way to the Ploshchad Tukaya metro station, so go for a leisurely stroll and see which places catch your eye. On the other hand, this is also the area in which accommodation is most expensive, so many footballs fans will probably be staying somewhere a little less central and a little more affordable. 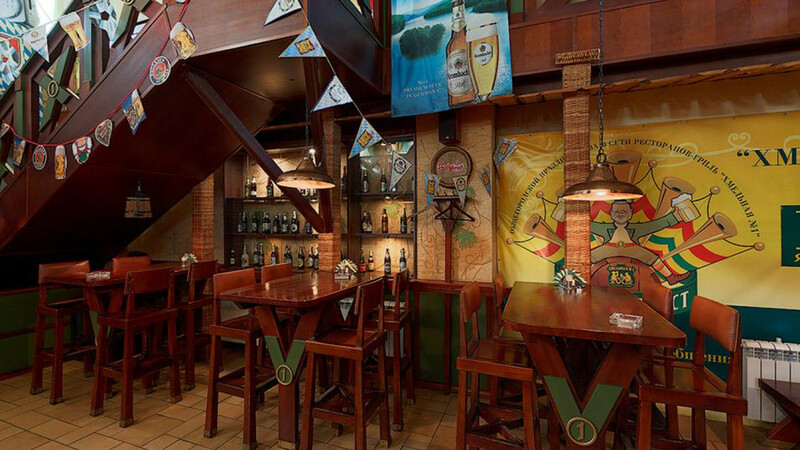 That’s why we’ve made sure this list also includes venues that are a bit further afield, but where the beer is just as good, and the guests just as enthusiastic about the World Cup as they are in the city center. Irish pub with many scottish whiskeys. Having a philosophy about the food that’s served is something you’d expect from a ﬁve-star restaurant, maybe, but not an Irish Pub. Trinity is an exception, though, even if their philosophy can be summed up in just a few words: “tasty food, and lots of it” — an excellent selling point if you’re targeting sports fans hungry for steaks, burgers and fries. With its green front and dark wooden interiors, Trinity plays up the Irishness as much as it can. And of course, that means they boast an impressive collection of both single malt and blended whiskeys (better not bring up the fact that most of them are Scottish rather than Irish). You’ll probably want to call ahead to reserve a table since the pub is popular and in a central location. Cheap beer wherever you are in Kazan. Hey, were you raised in a barn? No? Well, here’s your chance to at least watch a match there. Stary Ambar, meaning “The Old Barn,” is a chain of rustic, down-to-earth pubs that specialize in hearty meals and cheap beer, with a dozen different brands on tap, and bunch of bottled ones to boot. Of course, when you drink beer in Russia it’s quasi-obligatory to also order some grenki — large, garlicky, greasy bread croutons to help 3 soak up the alcohol. Here, they’ll only set you back 75 rubles, so there’s no excuse to not try them at least once. All in all, there are nine “Old Barns” in Kazan alone, all with ample seating and several television screens mounted on the wall. Just be aware that some of those screens are a little on the small side, so get there early to ensure a good seat, especially if you’re part of a group. 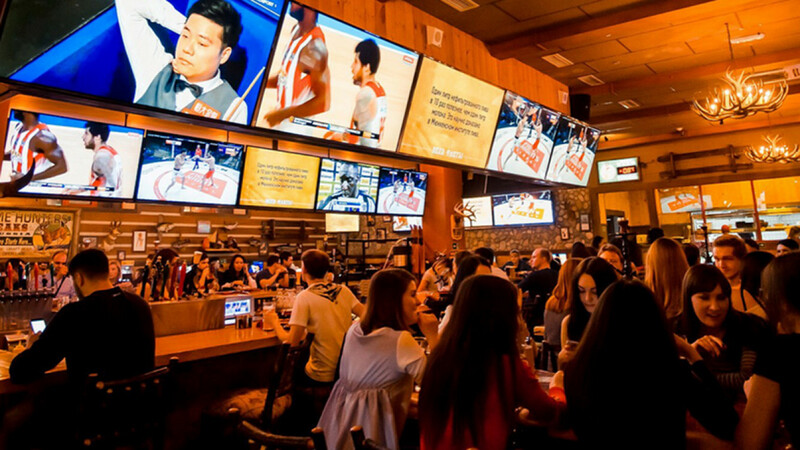 Enter this sports bar in the center of town and you won’t know where to look ﬁrst: at the crop-topped waitresses or the rows and rows of TV screens. 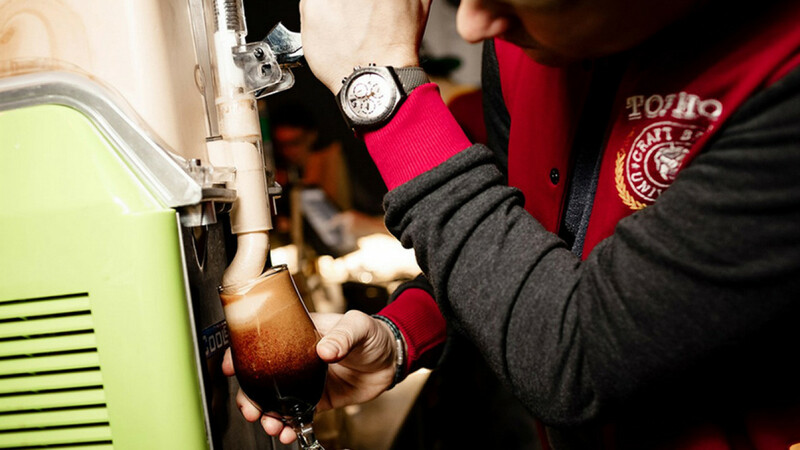 This is the ultimate frat house version of a pub, so it gets loud and crowded at match-time, and placing your order can take a bit of effort. On the other hand, it’s the one place in Kazan where almost any seat is a good seat to follow the action on the football pitch — if someone blocks your view of one screen, just look at the next one. When it comes to the menu, burgers are a popular order here, as is the plate of “Macho Nachos” — a whole pound of nachos, with ground beef on top. After midnight, Twin Peaks turns into a karaoke bar, with a range of fairly unusual items on the menu: For 1,000 rubles, you’ll get to sing a duet with your favorite waitress; for 3,000, she’ll sing you a solo song. Invest all of 50,000 rubles and her employer will give her the day off tomorrow! No guess as to which option she’ll prefer. This place is sure to keep any football fan happy, so grab your friends and check it out. Craft beer from all over the world. Let’s do a quick test: How many brands of beer can you list off the top of your head? Go on, give it a try. If you run out of names after a dozen or so, Top Hop is where you go to widen your horizon. Yes, there are four TV screens, but more importantly, there are also 40 kinds of beer on tap. Your basic lagers and stouts are well-covered, then there’s a strawberry-ﬂavored one no doubt invented by Belgian monks and a grapefruit-infused Weizen from the south of Germany — you name it, and they’ll probably have it. A couple of months ago, they even added a Dutch “hazelnut cupcake” beer to their menu, which boasts notes of nuts, marshmallows, vanilla, licorice, coconut and cocoa. If that’s too weird for you, check out their long list of burgers, some of them traditional, some odd and intriguing. So what if Italy didn’t qualify for the World Cup? At least here you can have a vitello tonnato burger in their honor. 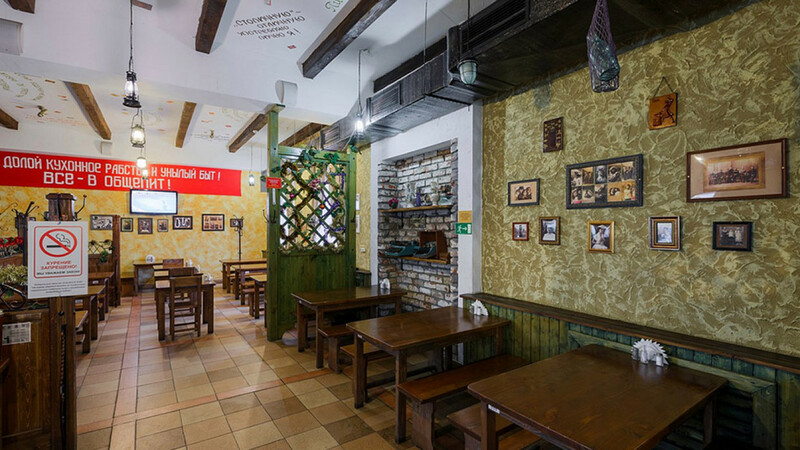 Located in Kazan’s southeastern Gorki district, this is one of ﬁve restaurants and cafés in the Turgay restaurant complex. With 220 seats, Khmelnaya is also the largest of the lot. It’s supposed to remind you of a German beer garden, so expect Krombacher, Paulaner, Franziskaner, Löwenbräu and Schöfferhofer beers and waitresses in dirndl dresses. 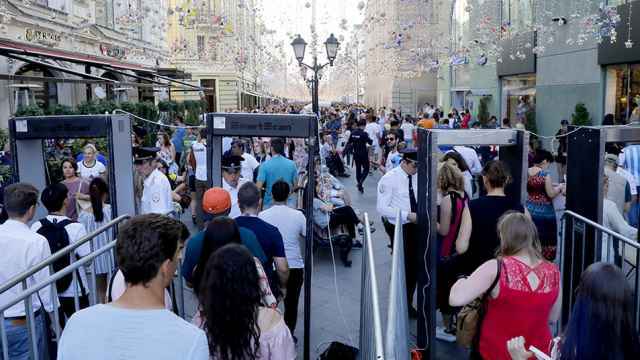 They regularly offer “three for the price of two” deals on some brands of beer, meaning you’ll pay around 600 rubles for three 0.5-liter beers. This turns drinking with friends into a legitimate money-saving strategy, so if you are traveling on your own, well: Time to meet some new people from among your fellow football fans! Get your joint beer order in, add a sharing plate of homemade sausages while you’re at it, and soon you’ll all be shouting at the referee in unison. 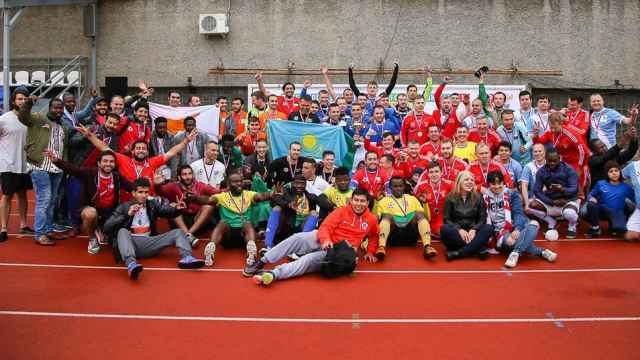 That’s what we call a result!